How To Tell If You Have a Lethargic Cat? Lethargy is the state of inactivity. It is defined as a condition wherein you lose energy and tend to sleep longer. It also happens to cats. One of the things a cat is good at is sleeping. A newborn kitten can usually sleep up to 22 hours a day while a grown-up cat can have a sleeping time of 13 to 16 hours per day. However, a cat can sleep longer than that depending on the activities that it performs. It is not really unusual to see your cat sleeping for so long and sometimes, it is just really lazy or not in the mood. That’s why it is difficult to tell if it is lethargic or not. Lethargy is not really a disease but a sign that something is not right with your cat. It can range from minor to severe depending on its condition. It is often characterized by sleepiness, lack of energy, and slow or lack of response. A lethargic cat often looks tired and it can show other signs which are related to the disease that it may be suffering from. There are breeds of the cat which are generally active. Most cats love to play different games and perform different activities. If your cat is usually active but you suddenly noticed that it’s becoming inactive, then it is something you should be concerned with. Cats love to do different things such as observing their surroundings, socializing with different people, taking walks with their owners and playing with their toys. If your cat starts refusing to do those things, it means your cat isn’t interested anymore. Lack of interest can also be a sign of lethargy. If a cat is lethargic, it tends to eat less than usual. Loss of appetite is a very alarming situation when it comes to cats. It can be a sign of lethargy and other serious health issues. If your cat eats less, as a result, it will lose weight and might even have more health problems. Although cats usually sleep for too long, excessive sleeping is still not a good thing for them. If your cat tends to sleep longer than usual even if it didn’t perform plenty of tasks, then it can be a sign of lethargy. Sleeping might be normal for your cat but you should always observe if there are changes when it comes to your cat’s sleeping routine. Sometimes these signs can be observed if your cat is too tired or not in the mood. But if the signs above are observed more than one to two times, you should bring your pet to an expert. How to confirm that your cat is lethargic? Well, it is always better to consult a veterinarian when there is an unusual behavior with an animal. In that way, you will be able to determine the underlying disease that your cat has, if it has any. The diagnosis will depend on the veterinarian’s suspicions. In order to know the reason why your cat is lethargic, the veterinarian might have to perform some tests like urinalysis, ultrasound, biochemical profile and blood count to your cat. Fading Kitten Syndrome (also called “failure to thrive”) is not a disease in itself. It describes a kitten that was born normal but slowly fades, then dies. One of the noticeable signs of this is lethargy. A kitten which suffers from this syndrome will not be able to get up and move. Other signs include pale gums, difficulty in breathing, and cold temperature. According to studies, 15 to 27 percent of kittens die due to this disease before they age 9 weeks. It is very difficult to detect until the condition becomes worse. It has to be detected early to prevent death. Feeding your cat too much can lead to some particular problems especially if it is prone to having some specific health issues. It can also cause your cat to bloat and have weight problems like obesity. In severe cases, it can lead to heart disease. If you don’t give your cat the right amount of exercise it needs, it will be difficult to maintain its weight. It might get sick and be lethargic. Sometimes, it can be fatal. Cancer is caused by uncontrolled growth of the cell. You can notice bumps on any part of the body of a cat with cancer. Cancer in cats can cause loss of appetite, aggression, and lethargy. To diagnose, a cat will undergo biopsy testing. Treatments are available but obviously very costly. Heartworm disease is caused by a parasitic worm which infects the heart and lungs of your cat. If its heart and lungs are not fine, then it can affect your cat physically and mentally. Signs of heartworm include asthma, vomiting, diarrhea, seizure, and weight loss. Your cat’s ability to do things will be limited because of this disease. Infections can be viral or bacterial. 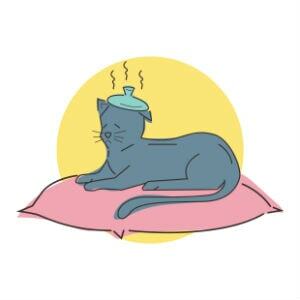 If your cat has an infection, it will probably affect its behavior. Some examples of viral infections that your cat can have are Feline Herpesvirus (also known as “Cat flu”) and Feline Immunodeficiency virus which is like HIV in human. Bacterial infections in a cat can be abscess, plague, Tularemia which it can get from a tick bite, urinary tract infection, and etc. Organ dysfunction is defined as failure of a certain organ such as kidney and heart. Other examples of this are liver disease, Addison’s disease, and jaundice. These diseases can be deadly if not cured. Abnormal things in a cat’s body can cause drowsiness and limited ability. Cats are curious about their surroundings. They tend to lick and eat new things that they see. Poisoning in cats is often caused by the things they eat. Poisonous things to humans are also poisonous for them but there can be a difference in how they will be affected. A cat with too many toxins in its body can be lethargic and can have difficulty in breathing. After undergoing surgery, microchipping, spaying or neutering, it is normal for cats not to be able to perform normally. This is because they don’t have enough strength or something is still painful. You will also be advised to limit your cat’s activity. Being lethargic is normal for a cat with this situation. Lethargy in cats can also be because of reduced oxygen level. It happens because of different illness such as anemia and pulmonary edema. This health issue can affect the heart and lungs. Similar to humans, it is also very dangerous to cats. It is difficult and tiring for us people to move if we have arthritis. Well, the same thing goes with cats. It happens as part of their aging process and due to trauma or infection for younger cats. The pregnancy of cats is not an easy thing for them. They have to feel the pain that pregnant people feel. They can’t speak directly to us so you have to be observant. Because there are hormonal changes due to a cat’s pregnancy, changes in their behavior can also be observed. The average litter count a cat can have is four. Vomiting, morning sickness, and lethargy can happen to a pregnant cat. These are considered normal at this stage. It can also be lethargic after giving birth because it still doesn’t have enough energy to move. Stress and depression in cats happen due to several factors that affect their mental condition like loss of loved ones, change in activities or environment, additional pet in the house, and etc. As a result, a depressed cat tends to hide, refuse to self-groom, lose its appetite, and have inappropriate litter-box behavior. Some effects can be aggressiveness and lethargy. In order to help your cat stop being lethargic, you have to seek immediate treatment if you notice any persisting signs and symptoms. The veterinarians are the best persons to determine the underlying disease that causes lethargy in your cat. If you are aware of its health condition, you should seek treatment first as it might be the easiest way to pinpoint or to rule out as the source of cat’s lethargy. The veterinarian might prescribe anti-biotic if it has an infection and other medications for viruses if it has any. Your cat might even undergo therapy sessions or surgery depending on the underlying disease that it is suffering from.